In recent years, Italian cinema has experienced a quiet revolution: the proliferation of films by women. But their thought-provoking work has not yet received the attention it deserves. Reframing Italy fills this gap. The book introduces readers to films and documentaries by recognized women directors such as Cristina Comencini, Wilma Labate, Alina Marazzi, Antonietta De Lillo, Marina Spada, and Francesca Comencini, as well as to filmmakers whose work has so far been undeservedly ignored. 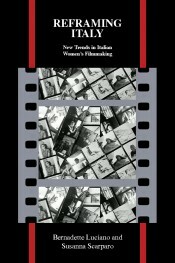 Through a thematically based analysis supported by case studies, Luciano and Scarparo argue that Italian women filmmakers, while not overtly feminist, are producing work that increasingly foregrounds female subjectivity from a variety of social, political, and cultural positions. This book, with its accompanying video interviews, explores the filmmakers’ challenging relationship with a highly patriarchal cinema industry. The incisive readings of individual films demonstrate how women’s rich cinematic production reframes the aesthetic of their cinematic fathers, re-positions relationships between mothers and daughters, functions as a space for remembering women’s (hi)stories, and highlights pressing social issues such as immigration and workplace discrimination. This original and timely study makes an invaluable contribution to film studies and to the study of gender and culture in the early twenty-first century. Bernadette Luciano, University of Auckland, New Zealand, specializes in Italian cinema and cultural studies. She has published articles and book chapters on Italian cinema, film adaptation, Italian women’s historical novels, women’s autobiographical writing, and literary translation. She is author of The Cinema of Silvio Soldini: Dream, Image, Voyage (2008) and co-editor of an interdisciplinary book on cross-cultural encounters between New Zealand and Europe. Susanna Scarparo, Monash University, Australia, works on Italian cinema and literary and cultural studies. She has published numerous articles and book chapters on Italian women’s historical writing, women’s life writing, Italian feminist theory, Italian-Australian literature and Italian cinema. She is author of Elusive Subjects: Biography as Gendered Metafiction (2005) and has co-edited Violent Depictions: Representing Violence across Cultures (2006), Across Genres, Generations and Borders: Italian Women Writing Lives (2005), and Gender and Sexuality in Contemporary Italian Culture: Representations and Critical Debates (2010).